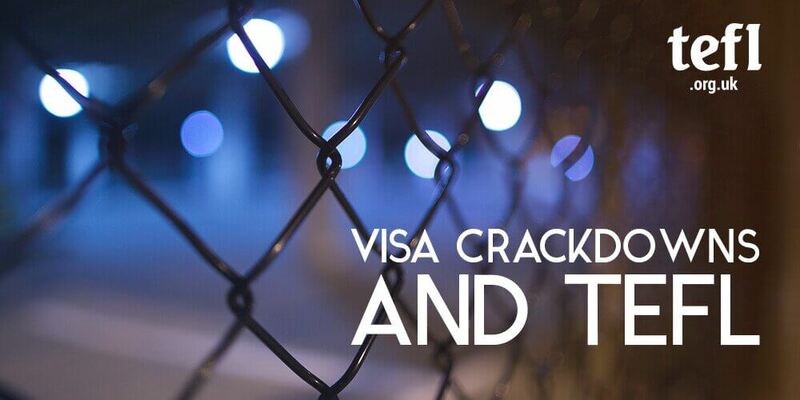 Reports of visa crackdowns – often in China, South Korea, and Thailand – spark panic every so often within the TEFL community. It can be troubling to hear about teachers being detained and even deported, particularly when these teachers may have thought everything was in order with their visa. Within the last year we’ve heard reports of crackdowns in South Korea targeting international schools registered as hagwons (cram schools) and in China the authorities have increasingly been sending home teachers who have been working illegally either using forged documentation or have been working on the wrong visa. While some people go abroad to teach and knowingly work illegally we do hear of cases where teachers have been led to believe everything was in order, or have been convinced by unscrupulous employers and recruiters they don’t need certain documentation and qualifications when they do. So how worried should you be? As long as you meet the visa requirements for the country you’re teaching in, you’re on the correct visa, and your employer is reputable you then shouldn’t be concerned. Below are some questions to ask yourself if you have any worries. What visa do I need to TEFL and what are the requirements? We always recommend thoroughly researching visas and their requirements to anyone thinking of pursing TEFL as a career. You need to know exactly what visa is required for teaching and you need to find out if you meet all the conditions to be eligible for it. Visa requirements can vary hugely depending on the country and are updated frequently, so it’s important to check directly with embassies and/or relevant government departments. Countries may only grant visas for teaching to certain passport holders, there may restrictions based on age, and many require a BA degree. There are teachers out there working on tourist visas or who have obtained a work visa using false documentation, putting themselves at real risk of being exploited by their employer. We don’t recommend this at all! Lucky for you we have an entire blog post to help you spot TEFL scams and bad employers, which is essential reading for any jobseeker. We are occasionally contacted by people who tell us they’ve been offered a job – usually in China – despite not having a BA degree or TEFL qualification. The recruiter/employer – or person posing as such – is usually very pushy. This is either a scam trying to get money from you, a dodgy employer (just think – if they’re willing to break employment law what else do they get up to?) or it could even be part of a sting operation carried out by the police targeting teachers already working illegally in the country. We’re aware of reports of this happening in China and it just goes to prove how seriously they’re taking the issue. Less reputable employers may try and get you to work on an incorrect visa and attempt to convince you it’s all above board, which is why it’s so important to do your own research so you know what visa you should be on. At the end of the day, you don’t want to be on the other side of the world and find yourself constantly worrying about getting arrested and deported – that isn’t going to make for a fun TEFL experience!